Bao is played by one person for each side. One player is called North and the other one South. 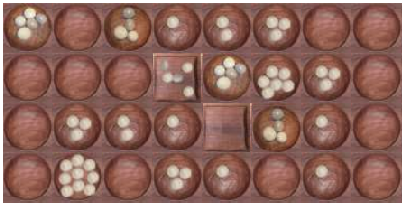 It is played with a board with 32 holes arranged in 4 rows. The two upper rows are owned by the player called North, the two lower rows are owned by the player called South. The two middle rows are called front rows and the two outer rows are called back rows. The fifth hole from the left (in perspective of the player) on each front row is called the nyumba or house and, on some boards, is shaped differently. 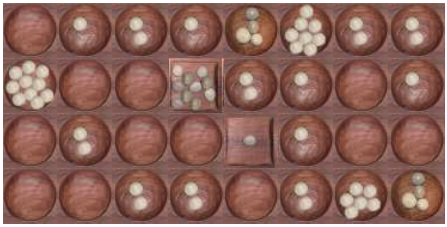 On some boards there are two other holes where are stored the player's counters. or in front of the player. 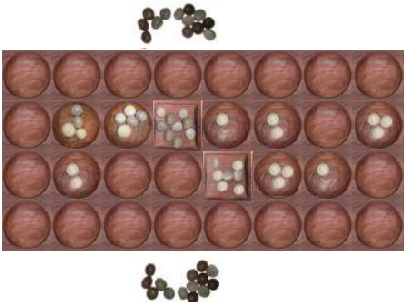 Where holes are indicated by the number of counters they contain (with 0 for an empty hole) and stores are on the right of each player. On the board there are 5 types of holes with different roles. X, store (with the counters to put on the board). The above symbols are replaced by the number of counters contained in the holes. Counters are 64 seeds, called, in Swahili, kete. Goal of the game The winner is the player who firstly empties the front row of the opponent or makes it impossible for the opponent to move. The basic move of Bao is sowing (spreading) of seeds. Sowing is the process of putting a determined number of seeds one by one in consecutive holes in the own two rows of the board in clockwise or anti-clockwise direction. It's not allowed to play a hole that contains only one seed. During sowing, the direction of the sowing cannot change. Capturing is only allowed if a sowing ends in a non-empty hole at the front row that has an opposing non-empty hole at the front row of the opponent (this is called mtaji, capital). The capture consists of taking all seeds out of the captured hole in the opponent's front row and sowing them immediately at the own side of the board. The sowing of captured seeds must start at one of the kichwas (head). If the sowing starts at the left kichwa, the sowing direction is clockwise, if the sowing starts at the right kichwa, the sowing direction is anti-clockwise. If the capturing hole is the left kichwa or kimbi, the sowing must start at the left kichwa. If the capturing hole is the right kichwa or kimbi, the sowing must start at the right kichwa. When another hole is capturing, the direction depends on the stage of the game. 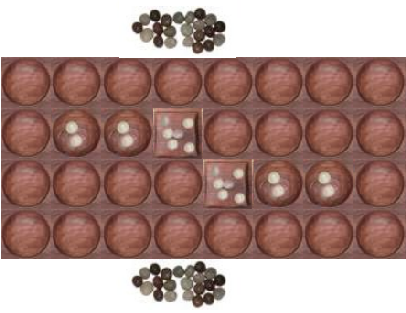 A move is a sequence of sowings and captures by one player. A move stops if a sowing ends in an empty hole or (in particular cases we'll discuss below) in the house or at a hole under kutakatia. After a move the opponent is to move. If a sowing ends in a non-empty hole (e.g., after sowing there are more than one seeds in the ending hole) and a capture is not allowed, then the move continues in the same direction by taking all the seeds from that hole and sowing the seeds starting at the next hole in the same direction. This continuation of sowing is called kuendelea (kuendelea=continue, move on). During endelea if the last seed of a sowing falls in the sowing ends at the owned house that contains six or more seeds the player can decide to play the house or to stop. Kuendelea stops if the sowing ends at a kutakatia-ed hole. Kuendelea stops if a capture is possible. The move continues according to the capture rules. Kutakata or kutakasa (kutakata=to clean). If player can't capture he is called to kutakata. If a move does not start with a capture, then capturing is not allowed at all during that move. During kutakata, the player keeps performing kuendelea until it ends (see this rule and this one). During kutakata, the direction of the move cannot change. Further rules depend on the stage of the game: kunamua or mtaji. The period of the game from its starts until all seeds are on the board and the stores are empty is called kunamua stage. 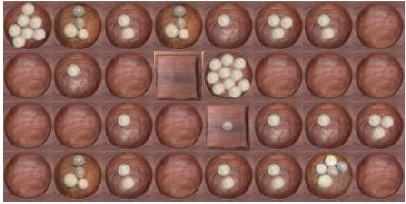 At the start of the game each player has 22 seeds in store, 6 seeds in the nyumba and 2 seeds in the two consecutive holes to the right of the nyumba. The first to play is South. The owned nyumba will be represented by the symbol # followed by the number of seeds. In this stage, the player starts each move with taking one seed from the store and putting it in one of his hole at the front row. It is allowed to put the seed in the nyumba only if it is possible to capture these seeds of the opponent's hole in front of it. South must take a seed from his store and can put it in the hole with 2 seeds or in the one with 1 seed. If the player can capture, he must put the seed taken from his store in the captuting hole following the capture rule. South must take one seed from his store and can put it in the hole with 2 seeds or in the one with 3 seeds or in his house (the best choice in this case as North could capture it!). 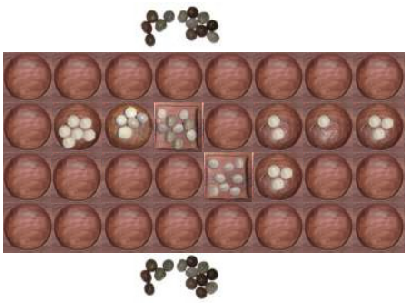 If the capturing hole is not a kichwa or kimbi, the player may choose which kichwa to sow from. South must take one seed from his store and put it in the hole with 3 seeds, so he captures the 3 seeds from the opponent's hole. In this stage, takata, which is performed only when it is not possible to capture,	cannot start in the back row. If the only filled hole on the front row is one of the kichwas, then kutakata cannot be done in the direction of the back row (because the front row will be empty and the game is a loss!). Kutakata cannot start from the owned house (nyumba) with six or more seeds. South can only play the hole containing 4 seeds. If it is the only hole filled at the front row, then one seed from the store must be put in it, two seeds have to be taken out and put them in the two holes immediately on its left or on its right. Kutakata cannot start from a hole with only one seed, unless there are no holes with more than one seed on the front row or unless the house is still owned (even with less than 6 seeds). South cannot perform a kutakata from the hole with only one seed. At the start of the game, both players own their house. Player loses its house if he empties it or when the opponent captures it. 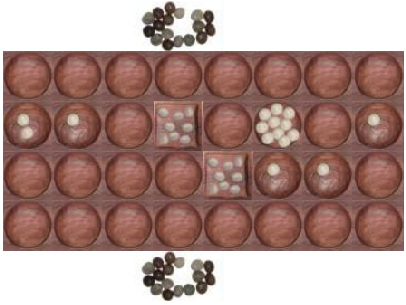 If the player still owns the nyumba and a sowing ends in the nyumba then the move ends during takata if the house contains six or more seeds, or the move ends during a capture move if no capture is possible at the nyumba and if the player wishes to stop. If a player does not wish to stop then the player is said "to play the house", which means that the house is emptied and its seeds are spread. The mtaji (capital) stage starts if all 64 seeds are on the board and the stores are empty. A move in this stage must start from a hole on the front row or back row. That hole must contain more than one (see the sowing rule) but less then 16 seeds. After spreading in a chosen direction, the last seed must allow capturing( capture is compulsory). South can play only the hole with 9 seeds to the right capturing the opponent's hole with 6 seeds. The sowing of the captured seeds from one of the four central holes starts from the right kichwa if the selected move direction was anti-clockwise, starts from the left kichwa if the selected move direction was clockwise. If no capture move is possible, the player must takata. If it is not possible to kutakata from the front row, the player can takata from the outer row. If the house happens to be still owned by one of the players, it stays owned until the first capture occurs. In this stage the namua rules for the house do not apply anymore, it cannot be kutakatia-ed. Kutakatia or Kutakasia (kutakatia=make to clean). then the opponent is not allowed to empty this hole under kutakatia. 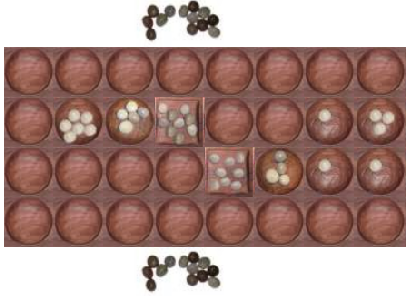 South performed a kutakata so that he will be able to capture the 2 seeds in the opponent hole, so North can play only the holes with 10 seeds. cannot be the only hole which allows the opponent to play. cannot be the opponent's house. 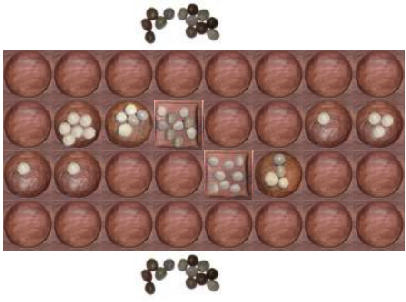 South performed a kutakata so that he will be able to capture the opponent's hole with 10 seeds, but this is not a kutakatia move, because the opponent's hole is the only hole in the opponent's front row with more than one seed. The above rules are adapted from: Alexander J. de Voogt (1995). Limits of the Mind. Towards a characterisation of Bao mastership. Ph.D. thesis, University of Leiden, The Netherlands. ISBN 90-73782-50-3 and from manuscripts of the "Dar es Salaam Regional Traditional Games Association" (Chama cha michezo ya Jadi Mkoa Dar es Salaam - Chamijada).